Due to a funeral, the midweek service scheduled for Killearn at 11.30 needs to be cancelled. Callander Vestry meets. Agenda to follow. This entry was posted in Rector's Bulletin and tagged Linkage Bulletin, St Mary's, weekly news on August 27, 2018 by Stmary. 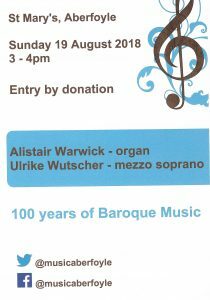 Sunday 16 September, 3.00 p.m.: Alastair Savage and Friends. This entry was posted in Concerts & Events and tagged Alastair Savage, Concert St Mary's, scottish Fiddle on August 23, 2018 by Stmary. It is with regret that Jamie’s death is announced. Funeral arrangements will be confirmed. May he rest in peace and rise in glory. Our prayers and condolences to the family. 28th July, the day of our first diocesan pilgrimage to St Andrews, was a day to remember. It was a day of sunshine and showers, a day for prayer and song, conversation and laughter. Those hardy souls who tramped the first five miles from the picturesque village of Ceres were rather damp when they arrived at Craigtoun Park. It was easy to distinguish between them and those who joined them for the second half of the journey. The excitement grew as we caught a glimpse of the twin towers of the Cathedral of Saint Andrew in the distance and the sun had dried clothes and hair by the time we arrived at Hallow Hill where even more pilgrims were waiting for us. A long line of about 70 walkers threaded their way along the Lade Braes towards St Andrew’s Church. There were Episcopalians from Leven, Lochgelly and Kinross, Dunfermline and Rosyth, Aberfoyle, Doune, Dunblane and Dollar, Stirling, Perth, Blairgowrie, Forfar, Cupar, Ladybank and St Andrews. There were Catholics from Tayport and Dundee, Methodists and members of the Church of Scotland, two medievalists from Glasgow University and a couple who live near the Camino in France. We arrived at our destination in bright sunshine and then made our way to All Saints for a welcome cup of tea and evensong. Thank you, Alasdair Coles and Nick Cooke for organising the pilgrimage, to the two churches at St Andrews for their hospitality and to all who led the reflections along the way and the final worship, including bishops Bruce and Bob. On the day, there was talk of another pilgrimage next year and some were even planning a trip to walk the Camino. In the meantime, should any church group like to walk part of the Fife Pilgrim Way in the coming months, Alasdair would be happy to be your guide. He can be contacted at alasdaircoles@btinternet.com. Monica, mother of Augustine of Hippo. This entry was posted in Rector's Bulletin and tagged Rectors weekly Bulletin, St Mary's on August 20, 2018 by Stmary. This entry was posted in Rector's Bulletin on August 12, 2018 by Stmary. John and sons Phil and Ian wish to thank all members of St. Mary’s and St. Andrew’s for their kind thoughts and prayers over the past weeks, which have been a great source of strength and support. This entry was posted in Rector's Bulletin on August 6, 2018 by Stmary.